Over the past five years, Team Liquid has grown beyond anything I could have imagined when I started the team almost 20 years ago. A name that I once thought simply “sounds cool” now means much more to me, our teams, our staff, our community, and our fans. Team Liquid is no longer just a clan on Battle.net or a free website hosted on cjb.net; it’s now one of the biggest and most accomplished esports organizations in the world. Every year, Team Liquid has come to encompass more teams, more games, more staff, and more ventures, and it is now a symbol that represents more than just myself and what I started with. All these different parts make up the whole that is Team Liquid, and our websites are an important part of our identity and our future plans. 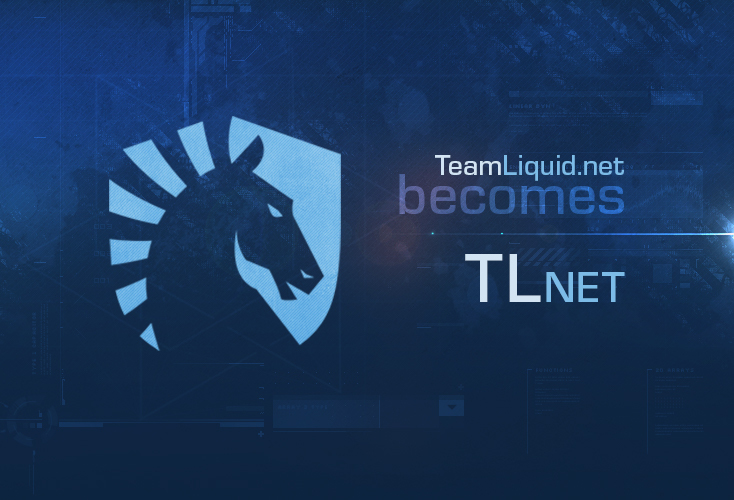 After a long deliberation, and even longer planning, we have decided to rename TeamLiquid.net to TL.net. This transition will take a period of several months as we prepare everything, and the teamliquid.net url will continue to redirect to TL.net so that the community can get used to the change. Once everything is ready, teamliquid.net will redirect to the pro team’s website at teamliquid.com. TeamLiquid.net is where our community grew, and I understand that this change must be difficult to welcome, especially for those who have been here for much of its duration. Everyone here deserves an explanation, and I would like to share our reasons for doing this. The short explanation of it is that this is a reorganization of how we name things. Our websites are dedicated to specific games and communities, and not to Team Liquid or its pro teams. This website is and always has been devoted to the StarCraft community, and it has always maintained its own editorial voice. The websites and our pro teams have always operated autonomously, and we are doing this to avoid long term confusion around the name Team Liquid. It's been nearly 20 years since I founded Liquid as a competitive clan and I fully expect for us to still be around in 2039 as a professional sports team that is hopefully rivaling some of today's major sports. In addition, this website deserves its own brand that it can call its own moving forward. As sad as it makes me as well, we really just can't continue forever with "Team Liquid" having two totally different meanings. The confusion is understandable. I first started Team Liquid in 2000 as a StarCraft clan of world class players, and when we opened the website in 2002, we used the name and fame from the team in order to get people to check out our website in those early years. The website was never meant to represent the team, because the website was its own community dedicated to our shared love of StarCraft. However, there is no doubt that it was this site that truly grew our name in the following decade. I would like to take this time to say something loud and clear. I owe a lot to all the amazing people who have contributed to this website over the years. Whether it is with hires, references, or other kinds of support, I always try to be there for our staff and contributors. You can find many of our former staff members in other positions within the esports industry, and we have Team Liquid staff within the larger organization who have been with us for close to a decade. We grew this site together purely out of passion and a shared hobby, and when I talk about the history of Team Liquid I always speak about the place TLnet has in it. I’m incredibly proud of this fact and I try to make sure that this is something that those who work with me on a regular basis know and understand. Next, I would like to talk about the timing. This isn’t something we decided recently, as we had been thinking about this conceptually for a long time. We struggled with pulling the trigger on renaming TeamLiquid.net because 1.) The name is very dear to our hearts; and 2.) We did not own the domain TL.net, the only name that we felt was good enough as a tribute to the community and the site. We tried buying TL.net in 2016, but the listed price was 6 figures, and our bid for the domain was rejected. The plan was put into hibernation, because it would have felt extremely awful for everyone, myself included, to compromise on a name that we were not happy with. Fortunately, in 2018 we received a message from the domain owner that he was looking to sell. We had the opportunity to purchase the domain for a fourth of the listed price, which was still significantly more than our bid in 2016, but we decided that the name was worth the investment. The sole reason for buying the domain is to move our site to a url that shows respect to its legacy. We have been calling the website TL or TLnet instead of TeamLiquid.net for a really long time, so by moving to this domain we are hoping that it is an accurate tribute that everyone can get behind. Lastly, I would like to thank all the staff that worked on this renaming, and those that work every day to make sure our websites continue to be a place that people want to be a part of. Our little clan built this website; this website helped build our team; and now we have a full-time team of web admins and developers who are dedicated to our existing websites — and even building new ones. This gratitude extends to all the volunteer staff and contributors, and the members of the community both old and new. As I said earlier, our websites are part of our identity and our plans, and so we have worked really hard on this in order to get it as right as possible. I understand that this will take some time to get used to, but I hope that I have shed some light on the whole process, and what this has meant for me especially. I only ask that you continue to support the staff, the community, and the game that we all love. StarCraft will always be special to me, and I hope to enjoy the game with this community for another two decades or more. The renaming will take place Wednesday next week, Wednesday, Apr 10 9:00am GMT (GMT+00:00). Some downtime is expected during the switchover. TL.net for TeamLiquid.net but you will LiquidDota.com and LiquidLegends? I would just try and make all the domains consistent with each other. Maybe TeamLiquid.net -> LiquidStarCraft. Not the best but more consistent and coincides with the rest of the name. Free up TL.net or TeamLiquid.net for a corporate branding site or something. Honestly the best response here is a huge congratulations! What R1CH, Nazgul, and the rest of the core staff have created for us and themselves is incredible. This change is a milestone in their careers that should be celebrated. I hope everyone, however critical you may feel, will say thank you above all else. Wether it is teamliquid, TLnet, or bluehorsies.gov I'm just happy to be a part of this community and love you guys. Thank you! This is a good question. LiquidStarcraft was definitely discussed as an option very early on. It was also ruled out very early on because Teamliquid.net is more than just a website about Starcraft. For many of TeamLiquid.net was our special little home on the internet which just happened to form over a common interest in Korean Brood War. It was a place where we won travian, called the Canadian consulate when Mani went missing and we all knew a certain story about a dog.... Renaming to LiquidStarcraft felt like we were throwing away that legacy and we couldn't bring ourselves to do that. Sure we have some inconsistencies across the network but we didn't feel like these issues were sufficiently pressing to overlook TLnet. Yeah, this is understandable. I've had to correct people many times on Twitter because they'll link to the wrong handle or something, and I'd imagine "teamliquidpro" is kinda confusing to business types/laypeople. Splendid. It's been far too long. Good idea TeamLiquipro always had a strange fell to it, congratulation on buying TL.net and let's hope it continue to grow under the new name! Also if I may what was the previous TL website, was it a website for tiny lamps? Because I kinda want a tiny lamp collector selling his name domain for 6 figures. It was just being squatted no interesting story. Aha. Secretly this was already revealed in the top right community site links on liquiddota. Many times I wanted to go back to teamliquid.net when browsing between the two sites and ended up on the pro site when clicking on teamliquid, really had to get used to click on the TLnet link. Now I'll have to get used to it more. Gonna miss the name a lot but the reasoning is understandable, teamliquid is a completely different brand now. Couldn't have said it better myself. Will teamliquid.net at least still redirect to TL.net? This transition will take a period of several months as we prepare everything, and the teamliquid.net url will continue to redirect to TL.net so that the community can get used to the change. Interesting. At this point typing teamliquid.net into my browser is so deeply engrained in my psyche that it will be hard to change lolol, but I support the change nonetheless. Also it’s so incredible to see how far TL has advanced even in the relatively short time that I’ve been around. From what I can tell, it really couldn’t have happened to a better set of guys. It always feels like justice to witness good people experience the success that they deserve and have worked so hard for. Just type T and hit enter. There should be no website that starts with T more visited then TL anyway, so it will automatically complete it for you.